A lot of people have asked me about what types of woods to use for friction fire making (for bow drill firemaking and the hand drill fire making methods).  This page concerns the types of wood used for the base board and the drill, as these are the two parts that actually rub together to get hot and make the coal. The types of wood used for the other parts of the bow drill kit are not that important, almost any wood will do for the hand piece and the bow itself. For the tinder bundle, you can make one out of native Australian materials as shown here. In general you want a wood that is soft but does not have too much resin in it. I have read in some places that you need the baseboard and the drill to be of the same type of wood, and in other places that they need to be of different hardness. The first time I tried to make a bow drill fire (when I knew very little about it) I tried to use a Gum Tree (Eucalyptus) stick for the drill and a commercial pine board for the base. I had no luck at all, after drilling all the way through the base board several times all I ever got was smoke. 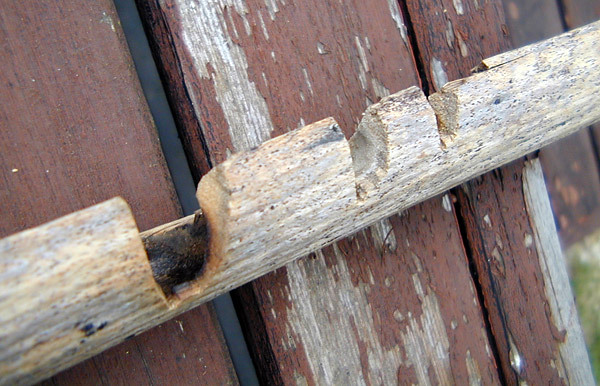 For the hand drill fire, Mullein is meant to be a good wood to use. Its a North American plant that grows here as an introduced weed. I have found that using two soft woods works best (provided they are the right types of wood). The kit demonstrated in my bow drill fire page is made from Western Red Cedar (Western Redcedar), scientific name Thuja plicata, which is a North American wood. It is mentioned on page 296 of Reader's Digest North American Wildlife, which is the book recommended by Jon Young for his Kamana One course. It is a type of Thuja, which is closely related to the Cypress Pines (Cypresses), scientific name Cupressus. Both the base board and the drill are made of this wood. If you try using commercially sold pine wood, make sure that it has not been treated with fire retardant chemicals. The upper drill is the Western Redcedar one shipped with the kit I bought from Thomas J. Elpel. 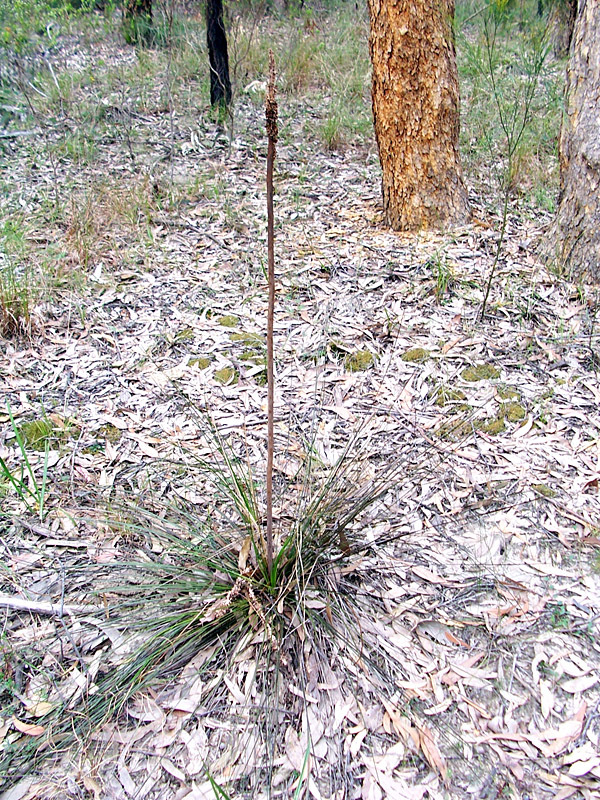 The lower drill is made from a grass tree (Xanthorrhoea) flower stalk, as described below. The best known Australian wood for friction firemaking is the Grass Tree, scientific name Xanthorrhoea species. The flower stalk as seen in the photo above can be used for both the baseboard (for the bow drill and hand drill fires) and the drill itself for the bow drill fire. I used the fattest stalk I could find and split in two down the middle for the base board, and the thinnest stalk I could find for the drill. These plants are usually found on ridges (that is, high up) rather than down in valleys. The flower stalks fall away after the plant has finished flowering, so you can find them lying on the ground without having to damage any living plants by taking the stalk from the plant itself. 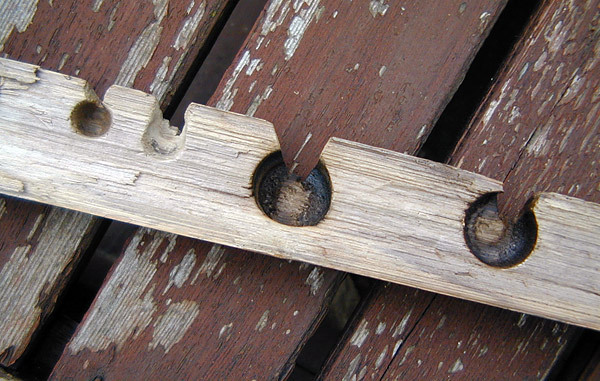 On the picture of the fireboard above the larger holes were used for the bow drill firemaking method and the smaller holes for the hand drill firemaking method. 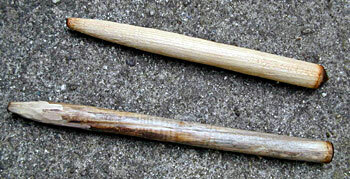 The smaller hand drill holes are fresh and have not been used to make a fire, while the larger bow drill holes have been used to make several fires. I have found that I could get about three fires per hole with the bow drill before the hole was drilled all the way through the fireboard. The fireboard (base board) in the pictures above was made from a really fat Grass Tree stalk split in half. To split the wood in half I used a large thick knife and hammered the back of the knife blade with another piece of wood. I found that the Grass Tree wood (using it for the bow drill fire for both the drill and base) was much quicker and easier to get a coal than the Cedar. It was approximately half as much effort to get a coal with the Australian Grass Tree wood. However it was a lot more difficult to get the coal from the Grass Tree to burst into flame than the coal from the Cedar. Possibly this is because the Grass Tree wood has a lower ignition temperature. If this is the case it might explain why it is easier to get a coal with it but harder to get the coal to set fire to the tinder in the tinder bundle.